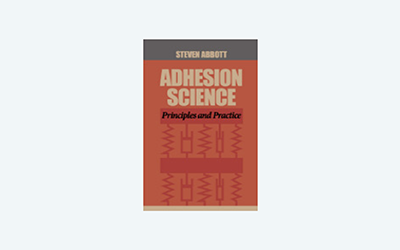 Have you ever had an adhesion failure in an unexpected part of your test sample? This is a rather specialised topic. I've included it because the one and only time I saw this phenomenon in a coating adhered to PET, it totally confused me and I wasted a lot of time looking in entirely the wrong directions. There's a simple, true story at the end which indicates other ways in which adhesion can fail in unexpected places. When we pull things apart at an interface it is rather easy to make two errors. The first is to look at the separated pieces and confirm the obvious fact that they have separated at the interface whereas in fact they might have separated a few μm into the lower material. The second is to observe that the separation took place via a crack in the lower material and immediately worry that something very odd is happening. Both errors arise because fracture mechanics is not always intuitive. We expect the crack to behave as (a) - propagating exactly along the interface. It turns out to be very normal for a crack which started at the interface (perhaps deliberately created for the test) to dip down into the lower material. Sometimes this dip is very small (b), sometimes it is large (c). Everyone doing such testing should have some idea in advance of what behaviour to expect. The idea is for you to input a known strain. Sometimes this is known by other methods (e.g. 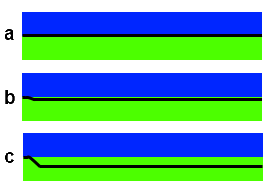 X-ray studies of Ni coatings). Sometimes it can be calculated. As a specific example from the book, a thermally induced stress is induced when a (relatively) thin coating is applied to a (relatively) thick substrate at high temperature and on cooling the higher thermal expansion coefficient of the coating provides a high strain. Will the system crack? And if so will the crack be precisely at the interface or will it enter the substrate? The inputs seem very simple: E, the modulus, and ν, the Poisson ratio, of each material, F the fracture toughness of the substrate (in MPa.m½). The stress σ in MPa is an input field but you can also use α the thermal expansion coefficient along with ΔT the temperature change to calculate a stress which you then manually enter into the σ slider. From these it is a long road to calculating whether a crack will form and, if so, where it will occur within the structure. All details can be found in pp174-185 of Lacombe. Subscripts are 1 for the coating and 2 for the substrate. 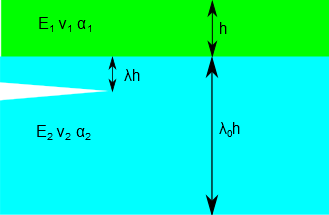 The crack depth is first calculated as λ in dimensionless units then multiplied by h1 to return to dimensional units in μm. The stiffness ratio Σ and the Dundur α are fundamental to the stress analysis. If the stress intensity KI is greater than F cracking is likely and its background colour changes from safe green to dangerous red. The default settings on startup are the polyimide on glass ceramic values from Lacombe pp181-2. Although this is not at all the same phenomenon, it makes the point that forces in one place can have unexpected consequences somewhere else. I was asked to help solve an adhesion failure between a metallized film and a polymer. This is a common problem and all the usual suspects had been investigated. It was a complicated package and eventually it became clear that failure was correlated not to anything near the aluminium but in a layer nowhere near the Al. If this layer was HDPE, the Al did not fail. If it was LDPE, the Al adhesion failed. Here's the explanation. The adhesion failure was during a tear test. If the remote layer was HDPE, the whole package tore nice and cleanly. When the layer was LDPE, the whole package was weaker and distorted under the tearing test. Those distortions funneled crack energy to the Al layer and caused delamination. So it wasn't a case of the "real" adhesion of the Al changing; it was a case of the forces at the Al layer being much higher thanks to the LDPE layer.